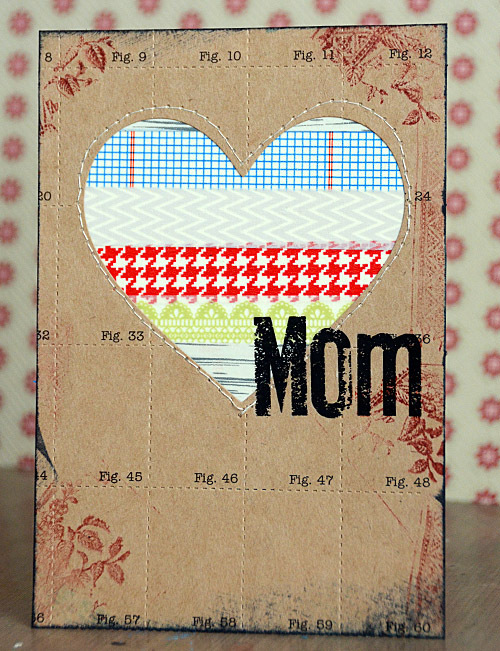 May Flaum here, getting started on my Mother's Day cards with the fabulous new paper tapes from JBS. I love layering strips of tape and then either punching, die cutting, or layering with another piece of paper in some way! I think it is a fun way to use lots of tape and I always love that I can't quite predict the exact outcome since I'll be seeing only part. Here you can see I put strips of tape onto a piece of cream cardstock, then I took my favorite kraft JBS paper and cut a heart out so that I could layer it over the top of my tape strip paper. I stitched around the edge (a totally optional step), then used some ink around my edges, used rub-ons for my sentiment, and stamped pieces of this album stamp that I'm loving as well. Whether alone or together - I sure do love all of my paper tapes!